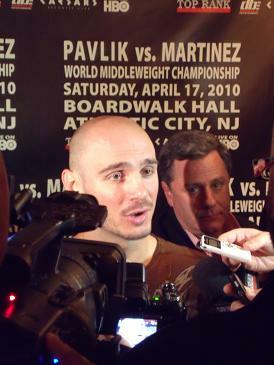 On Saturday April 17th, Kelly "The Ghost" Pavlik (36-1, 32 KO's) will defend his WBC and WBO middleweight titles against Sergio "Maravilla" Martinez (44-2-2, 24 KO's) at Boardwalk Hall in Atlantic City, N.J. The fight will be televised LIVE on HBO at 10pm EST following the second episode of 24/7 - Mayweather vs. Mosley. At Gallagher's Steakhouse in Manhattan this afternoon, Top Rank C.E.O., Bob Arum, addressed the media. "It's been a great, great division," declared Arum. "Saturday night at Boardwalk Hall the tradition continues." 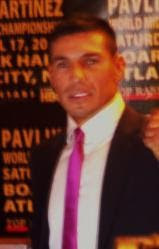 This will be Pavlik's 4th appearance at Boardwalk Hall, where he previously captured the WBC and WBO middleweight titles from Jermain Taylor in 2007. Martinez's last fight occurred at Boardwalk Hall, in which, he lost a highly controversial 12 round majority decision to Paul Williams. HBO's Sports President Ross Greenburg stated, "There are certain fights you buy that are can't miss fights. This is one of them." "Ross Greenburg really made the fight happen," acknowledged Lou Dibella, C.E.O. Dibella Entertainment. "Kelly took the hardest guy who wanted him. It will be a battle of techniques; speed and agility versus punching power and aggressiveness. There will be a new champion on Saturday night." Martinez appears eager to display his skills on Saturday night. "You will see a great fight," said Martinez. "All this year I have been training for this fight." Pavlik's trainer, Jack Loew, does not seem too concerned about Martinez's talent. "Kelly is in the best shape ever," said Loew. "Monzon won't be there, Martinez will. I'm glad he knows how to ride a bike because he will be on one Saturday night. We respect him, but we'll go back to Youngstown with the belts." Bob Arum believes Pavlik, 28, is one of the hardest punchers he's seen in years. Pavlik is definitely one of the heaviest hitters in the entire history of the middleweight division, and holds an 86% knockout percentage over his opponents. As a result of Pavlik's knockout power, many observers overlook his complete boxing arsenal. Pavlik's jab is one of the best in the business, and he drives the opposition backward regularly when he utilizes it. Since suffering his only professional defeat to Bernard Hopkins, Pavlik has been widely ridiculed for his lack of lateral movement. In that bout, Hopkins repeatedly beat Pavlik to the punch and used an incredible amount of angles to keep him off-balanced, which is the reason why numerous people are picking Martinez to win. Martinez, 35, fights at a fast pace and possesses outstanding boxing technique. Will the southpaw from Argentina be able to nullify Pavlik's power? Martinez is an exceptional fighter from the outside and will exchange with anyone, although his power is underrated. Against a devastating puncher like Pavlik, Martinez may want to fight at a distance where he controls range and dictates the pace of the bout. Pavlik does not see the fight turning out that way. "I see him starting fast in the early rounds and slowing a bit in the middle rounds," stated Pavlik. "I expect a dominating performance." When he faced Hopkins, Pavlik weighed 168 lbs. As far as moving up in weight again, Pavlik does not anticipate that happening soon. "I will fight at 160 lbs. until I cannot make weight anymore," said Pavlik. "Right now, I don't have a problem." For Martinez, this will be his first notable opponent at 160 lbs. 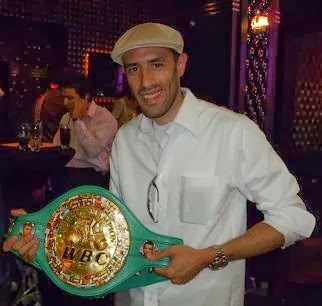 If Martinez wins, it will probably be the result of him outworking Pavlik with a great deal of volume punching, as well as minimizing heated exchanges with a bigger, deadlier puncher. Can Pavlik catch the slick moving Martinez? Or will Martinez find his range like Hopkins and beat Pavlik to the punch all fight? With so many questions, there are so many answers. Yet, this epic fight should produce a definitive conclusion. Wow I had no idea Pavlik had such a high percentage of knockouts in regards to his opponents. I knew he was a heavy puncher, but I think I may have underestimated it a bit. This really should be an interesting matchup of divergent styles. I heard this is for charity. Gee, I hope so. Really, I do believe this will be an awesome fight. Saturday, great people, gloves, discipline and 1 amazing promotional material which is, a pair of long boxing baby blue and white trunks with flags on them. What would be great is baby blue boxing gloves. If it is for a benefit then you may need a cape. Fortunately, I will be visiting attending an event, but maybe I will see the fight, a little late. Around 10 pm. Martinez will win, because 2 relatives of mine .?. are full Argentian. I hope you can beat him for charity. This is what I heard & it is only right. Is this for kids with autism or lupis? th Are you casually get paid for this or is this really for charity ...I've been hearing a lot of that lately. I don't understand . Although, I will be busy dedicating some time to an unpaid - non-paid project call 973-744-6012 for help connecting with someone who can talk up your fights. this day Saturday >>> Martinez, if you need help connecting with the best juicing up the talk on your fights. I am a female and no stranger to the boxing game. I wonder how much of the money will really go to charity?...Martinez good Luck.